If security and budget spending is not focused in the next few years on securing our borders, from the North to the South, insurgency will continue to engulf the Nigerian population and deplete our sovereignty and economy. The Zamfara bloodbath, Kaduna killings in Kajuru, Benue massacre of farmers and several other streams of blood across the country are largely instigated by porous borders, according to findings. A book published in 2012 by Zimbabwean author, Robert P. Mutwira titled “Asylum-Seeking Fever”, says Chad and Niger alone, boast of over ten terrorist groups collaborating with bandits across borders, including Nigeria. What it means is that Zamfara, Borno, Yobe, Adamawa and other Northern states bordering Chad and Niger Republics will continue to be hotspots for cross-border terror, if Nigerian budgets do not quickly address the problem of border security. Former Senate President, Dr. Iyorchia Ayu in a lecture he delivered a few years ago at Afe Babalola University, attributed the terror in the Northeast to clandestine interests of France in the oil basins of French-speaking West African countries, colonized by France. Dr. Ayu claimed that as long as there was instability in Nigeria, where the oil business is too competitive for France, the western country will make peaceful hay in francophone border countries it has total economic control of. 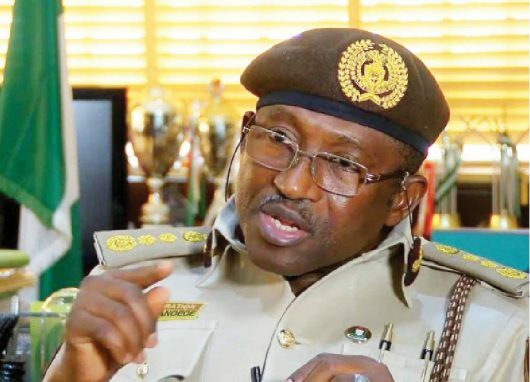 Lt.-Gen. Abdulrahman Dambazau on his part, last year, urged personnel of the Nigerian Immigration Service to devise innovative means of securing the nation’s vast borders. Addressing officers and men of the NIS in Abuja, Dambazau described border security and management as one of the “greatest challenges’’ facing the country. According to News Agency of Nigeria, the minister spoke after decorating a newly-promoted Deputy Comptroller General of Immigration, Juliet Fariku, at the agency’s headquarters. Dambazzau said: “You know the challenges today particularly in the area of security, in your own case, border security and management. “This is one of the greatest challenges we have today. “Our borders are porous; we must find means of ensuring that we always protect our borders against the incursion of criminals. Dambazau also tasked the NIS personnel on effective implementation of relevant presidential orders on the ease of doing business to move the economy forward. He said issuance of international passports, visas and other travel documents under the purview of the service must be done within 48-hours. He said: “Secondly, we must support the government in the area of moving the economy forward. “You all are familiar with the presidential orders on the ease of doing business. These orders are very important if we must attract foreign direct investment. “We must protect our borders; we must be able to issue visas on time. The minister noted that prompt issuance of visas was a key facilitator of movement, which in turn was critical to improvement of the business environment. Dambazau said: “Business, movement, exit and entry of people is both ways. While we encourage people to move in to invest in our country, we also have business people within our country moving out. While congratulating the newly-decorated CGI, Dambazau advised her to brace up for the additional responsibilities that the new rank had placed on her shoulders. He also stressed the need for the rank and file of the agency to rededicate themselves to national service through commitment, diligence and hard work. The Comptroller General of Immigration, Muhammad Babandede, highlighted some key reform initiatives of the NIS management, including restructuring of the agency for enhanced service delivery. Babandede enumerated some of the initiatives as creation of new focused directorates, including the Directorate of Border Management, introduction of Visa of Arrival and launch of new immigration regulations, among others. The minister later inaugurated a new conference room and about 1km concrete access road, constructed by the NIS at the agency’s headquarters in Abuja. But rhethoric is not enough. The federal government must be seen planning for the future. In the western hemisphere, Immigration rules are amended to suit the dynanims of the subject of immigration, which is in a state of flux. The federal government ought to also push hard for a review of the ECOWAS treaty, to be in line with your current circumstances. On May 1979, ECOWAS member States adopted their first protocol relating to the Free Movement of Persons, Residence and Establishment. It stipulated the right of ECOWAS citizens to enter, reside and establish economic activities in the territory of other member states and offers a three step roadmap of five years each to achieve freedom of movement of persons after fifteen years. The first phase regards the right of visa-free entry, phase two dealt with the right of residency, and phase three concerns the right of establishment in another member State. The first phase have been fully implemented. The second phase, the right of residency, has also been implemented, given that citizens had obtained an ECOWAS residence card or permit in fellow member State. The third phase, the right of establishment, is still under implementation in most member States.